Any landing you can walk, (or swim) away From, is a good one. The photo is of a P40L fighter that Lt. Michael Mauritz of Turtie Creek, PA crash landed after being hit by enemy fire while strafing the Germans in the Nettuno area of Anzio Beachhead on Jan. 31.1944. Pretty good shape after 54 years under sand and sea water and a good example of home-front quality. 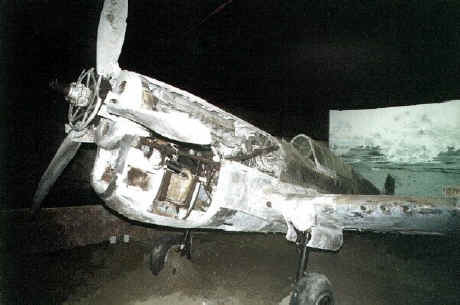 The aircraft pictured above belonged to the 86th Squadron of the 79th Fighter Group stationed in the Capodichino airport of Naples in 1944 and V was dedicated at a ceremony at Piana delle Orme (Latina) museum on September 6, 1998.. On January 31, 1944 this plane piloted by Michael Mauritz of Turtle Creek, PA took off to carry out a mission over the Nettuno areas where our Infantry Divisions were engaged in combat at the Beachhead. 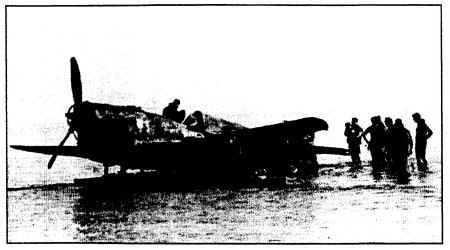 During the flight over the German lines firing, an unexpected engine damage forced Lt. Mauritz to alight his plane in a shallow stretch of water close to the beach near Foce Verde (Littoria). While the plane is sinking, Lt. Mauritz with his lifeboat, reaches the near beach where soon he was captured by the Germans and later sent to the War Prisoner Camp of Laterina near Arezzo. Later he escaped and was able to reach his Air Group aided by the Italian guerillas. After 54 years buried in the deep sea sands the plane was discovered by Italian subs and later, after technical support of private Societies such as Archeosub Pontino, A.R.C.O. and G.A.V.S. and great assistance by the Italian Air Forces, the plane was rescued intact. Meantime with the assistance of the U.S. Air Force, was found the name of the pilot of the plane and Lt. Michael Mauritz was invited to recover his aircraft after so many years. Invited to represent ali U.S. Veterans of the Beachhead, I attended the ceremony in honor of Lt. Michael Mauritz who came directiy from Turile Creek, PA. Emotioned, Lt. Mauritz looked at his Curtis-P-40L after 54 years of the dramatic sea landing. I talked to him and he said that he did fly over German lines where we were in front fighting them. Was an important day of celebration to remember the fallen comrades of the 3rd Infantry, the 45th Inf. the Rangers, the paratroopers and all others who are buried at the War Cemetery of Nettuno. The ceremony continued with Air shows, parachutists, balloon, ultra light aircraft, helicopters and band of Bersaglieri (Italian feathered hats troops). The plane will remain in exposition at the Mario De Pasquale Museum at the Piana Delle Orme, Borgo Faiti near Latina and can be visited every day. The Museum includes large sheds with U.S. Air Force aircraft, U.S Army tanks, guns, weapons used during WWII. Plus there are sheds representing scenes of battles with dressed soldiers mannequin fighting and sound of guns and firing arms. It is something like that I visited at Fort Bragg in North Carolina Museum. It’s a place where you can spend a day in the open air with bars and restaurants. Buddies of the 3rd Division: your "Fighting Paisan" is waiting for you to take you to the battlefields spots where you were and where I was too. I even found your foxholes at Isolabella, Ponte Rotto, Femmina Morta, The Factory, The Dairy Farm, etc. Visiting those battlefields is always so impressive and buddies such as Angus Mclean, Thomas L. Wright, Chester L. Hunter and the many groups of soldiers of the Third stationed in Germany were enthusiastically satisfied. Once a 3rd Division veteran whom I brought to the same spot at Isolabella were he had been, said "Seems that I never moved from my foxhole"